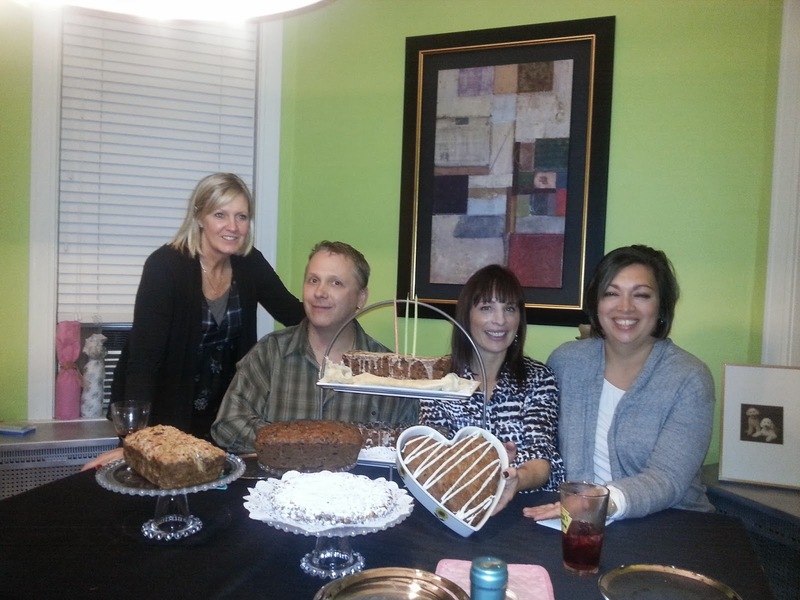 Mondo Fruitcake: The Fruitcake Tasting! Look at these lovely people! These were some of the people baking (and eating) the fruitcakes from Friday's fruitcake tasting. Every single cake was delicious, and the types of cakes really ran the gamut. I'll post links to the recipes once I have them, but I can give you a run-down of the types of cakes we had. The one theme? They were all delicious--seems like most home-made cakes are! The two loaves on the iron stand in back were both more traditional loaves--full of candied and dried fruit that had been macerated in alcohol, along with rich cake that was dark from brown sugar or molasses. The cake to the far left was very similar (or might even be) a type of cake called Bishop's bread. It was delicious, but we all questioned if it really qualified as a "fruitcake." It did indeed contain fruit: cherries and figs, I believe, as well as nuts (pecans, I think). But the addition of CHOCOLATE CHIPS made it deliciously sweet and decadent. It was hands down the winner in the "which is the easiest cake to eat and enjoy" category. The other two (the other loaf and the cute cake in the heart pan) both contained fruit, mostly dried, and both tasted more like a quick bread. The one that was loaf-shaped was flavored with cinnamon and had a similar spice profile to a banana bread. They were both quite yummy tasting; however, the heart-shaped one was a bit dry, which we determined may have been because it was baked in that pan, which may have caused there to be a bit more evaporation. It was still delicious; perhaps it could have used a bit of a dousing of rum or whiskey (always good in my book). Finally, that very powdery white blob in the lower center was the panforte I made. The panforte is really more like a candy than a cake: it contains similar ingredients to a fruitcake, just in different proportions: sugar, honey, flour, candied fruit, hazelnuts, and almonds. The tasters likened it to a Payday bar, but with fruit - very gooey and a crowd pleaser--I think everyone enjoyed it.